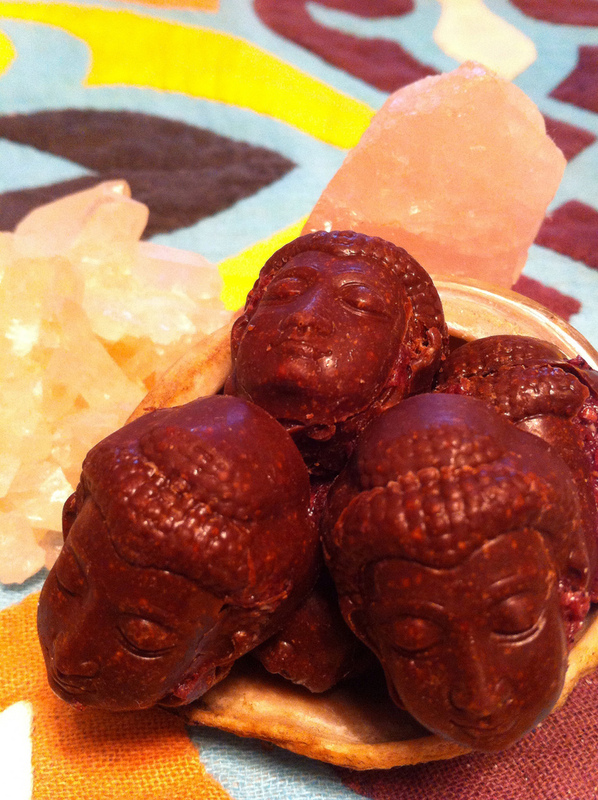 Sacred Strawberry Raw Organic Treats has a delectable variety of sweets and treats handmade and packaged with love for you! Our current offerings include chocolates, kale chips, savoury crackers and Love Balls. All raw, all gluten-free, all vegan (unless specifically noted), all organic and all delicious! You can find us at the Shreveport Farmers Market from 7 am till 12pm every Saturday this summer beginning May 31 2014 and anytime at Sunshine Health Foods on Youree Drive in Shreveport or Airline Drive in Bossier City. We are also on Etsy (sacredstrawberry), or contact us directly and we will be more than happy to set you up! We will even do free local deliveries for orders over $20. 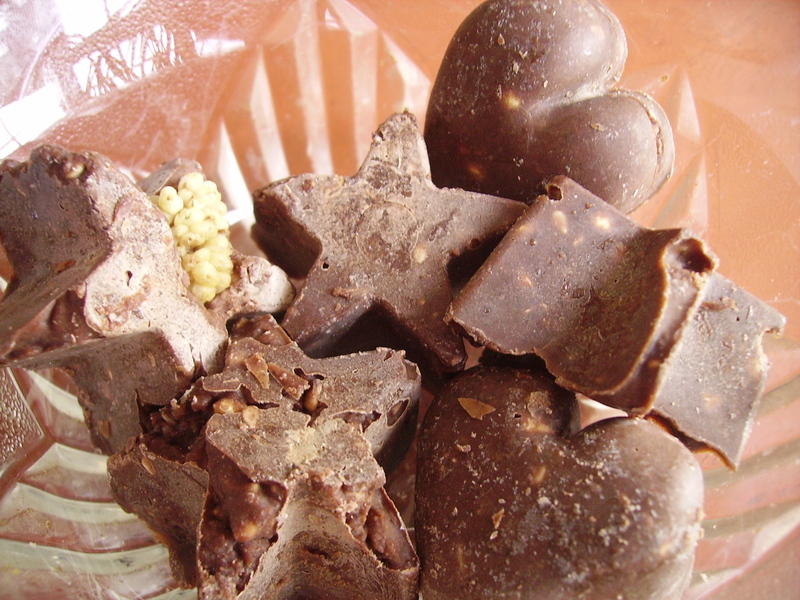 Our raw chocolates are handmade in small batches using the highest quality raw ingredients. 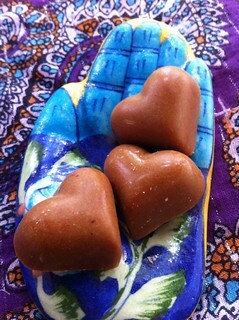 We consider chocolate in its natural state to be a sacred and nourishing food and our creations reflect that. 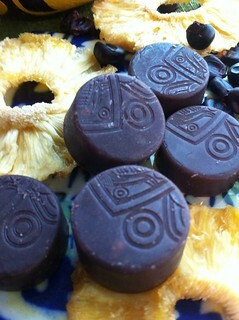 We also offer chocolate date lollies and chili chocolate covered mangos. 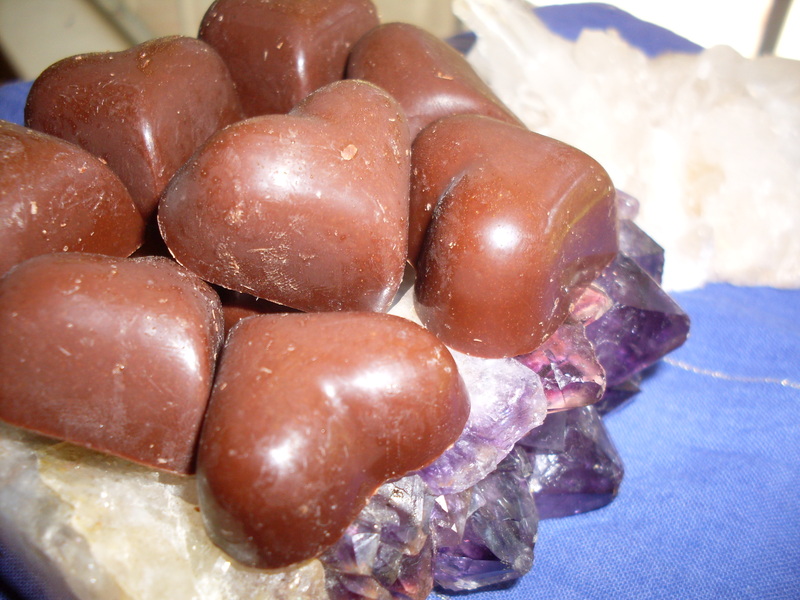 All chocolates are sweetened with coconut sugar and coconut nectar unless otherwise specified. Local raw North Louisiana honey is available for those who prefer, as well as stevia and/or xylitol for diabetics or those who want a chocolate with a low glycemic index. Chocolates are 1.20 each, except for Loveberry and Wild Jungle Peanut Butter/Coconut Butter Cups which are 1.50 each. Boxes of 10 are $12.00 and flavors can be mixed and matched. If you want some chocolate at the Farmer’s Market, let us know! Due to the Louisiana summer heat and humidity, we can’t put our chocolates on display but we are more than happy to take orders and store it in the coolbox until you pick it up. Our kale chips are handmade with love using locally grown kale when possible, seasoned and dehydrated at a low temperature for a long time in order to preserve all the green goodness! Our flavors are seasonal and we try to take advantage of nature’s bounty and source local ingredients for our flavors whenever possible. Garden Chips are a perfect way to enjoy nature’s seasonal bounty. They change throughout the year depending on what is available and abundant but are always delicious. Currently, the chips include tomato, squash, zucchini and poblano pepper. They are coated in a garlicky sprouted buckwheat and seed coating and dehydrated to perfection! *NEW* We have started offering a few smoothie supplements that we have formulated over the years because they are products that we love and use all the time. We truly believe that they are the best blends ever and just know you will love them too! We also offer special event catering and raw vegan meal delivery. Contact us for more details! Hey! I bought from you at the farmers market today! I loved the chocolate:) I will be seeing you for some more –for sure! Thanks again for the yummy chocolate! Hi Jennifer! Thanks so much for connecting! Yes, I remember you and your little one:) I am glad you liked the chocolate. I loved making it! I will absolutely check out your blog. I bought from your booth yesterday from the Farmer’s Market and I am impressed and intrigued by your products! I can’t believe you are in Shreveport. I love the spicy cheese crackers! I’m a foodie and a vegetarian. I recently lost 30 pounds through ideal protein, but and transitioning into whole foods ( green smoothies for breakfast). Your blog says you have workshops. I would love to attend one and I have friends that would like to come too. I will be down Tuesday to purchase more! I did not get any chocolate . Now I want to try!!!! I really thought I replied to you earlier! I guess it didn’t go through or something! Anyway, thank you so much for your comment. I am so glad you enjoyed the crackers! Congrats on your success! I am most definitely a work in progress myself! I haven’t given any workshops since I moved back to the States, but if you are interested I would absolutely start again! Just contact me via email or facebook and we can discuss it. The chocolates have been hard to do at the Farmer’s Market logistically with the heat and all, but if you ever want some, just let me know and I will make sure to have some there. Thanks so much for your interest. Hi Emily, I haven’t met you yet but my husband and I have been to your booth the last 2 Saturday’s and I love everything we have bought! 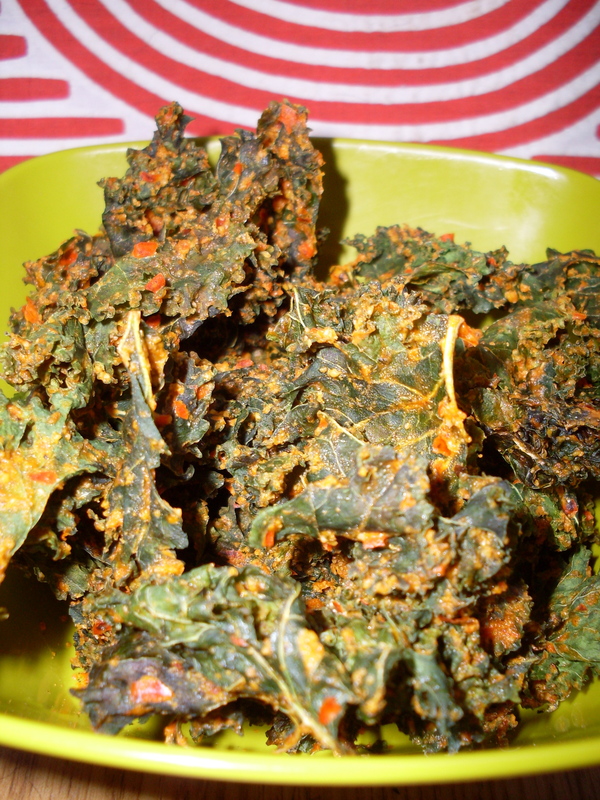 Mmm kale chips,raw crackers,love balls,and that green lemonade! We met your husband and he is so nice..I’m the one recovering from a broken ankle. Anyway we are so glad you are here! Just finished some of the pesto crackers and so love them! Looking forward to experiencing more of your fabulous healthy creations. Keep up the good work you are very appreciated!